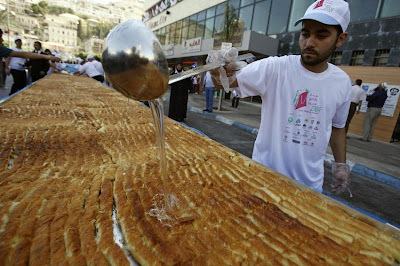 Palestinian confectioners on Saturday entered the Guinness Book of World Records with a giant plate of Kunafa pastry they baked in the West Bank city of Nablus. Kunafa is a cake sprinkled with pistachio and made of semolina, white cheese and a sugary syrup sprinkled with rose water.Mohanned Al-Rabbi, director of the Palestinian Company for Real Estate Development and Construction and the organizer of the event, said that the plate weighed 1,765 kilograms, 400 kilograms more than the needed weight to set a Guinness World Record. The plate was more than 75 meters long and one meter wide. 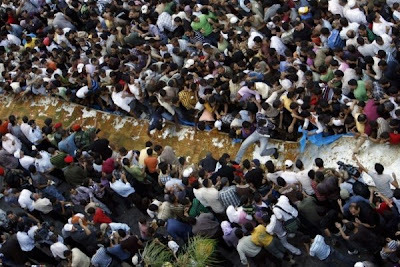 Rabbi said that it took 150 local makers of Kunafa 25 days of preparation and 36 hours of constant work to prepare the giant plate. The project cost a whopping $15,000 and is expected to feed around 6,000 people. Its massive ingredients include 600 kilograms of white cheese, 300 kilograms of sugar and six tons of cooking fat. Palestinian Prime Minister Salam Fayyad unveiled the plate, part of a month-long Nablus shopping festival event intended to revive Nablus’ shattered economy. Several foreign diplomats attended the ceremony, including Jake Wallace, the US Consul General in Jerusalem. Israel had considered Nablus a hotbed of Palestinian anti-occupation groups, particularly Al-Aqsa Martyrs Brigades, the military wing of the ruling Fatah movement in the West Bank. Al-Aqsa Brigades started up in Nablus in 2000 and then spread to the rest of the West Bank and to the Gaza Strip. It was responsible for several military attacks against Israelis that left hundreds dead and wounded. Israel responded with a fierce military campaign against Nablus fighters, waging daily military incursions into the city killing and arresting hundreds of its fighters and civilians. The Israeli military operations, closure and the chaos caused by the local fighters forced most of the Nablus businesses either to shut down or relocate to the capital of the Palestinian Authority, Ramallah, 50 kilometers to the south, where movement was easier and business was thriving. However, since Fayyad took office in his first government two years ago, he vowed to end the activities of armed groups and the chaos in the West Bank cities and restore law and order to them, an Israeli requirement for easing its blockade. The Huwara roadblock to the south of Nablus used to be the West Bank’s worst bottleneck, allowing Palestinians to cross only on foot after long waits. Now, for the first time since 2000, they can drive through. The Israeli Army has loosened the other checkpoints in its noose around the city after it was convinced that law and order had been restored and the fighters had been reined in, and around 100,000 visitors from several West Bank cities, Arabs inside Israel and foreigners entered the city to enjoy the city’s shopping festival. “We need to enjoy our life despite all the difficulties,” Ahmed Al-Aker, one of the oldest confectioners in the city, said. “Life is much better now,” he said. “People can do business without worrying.” “We had an uprising, we had hardship under occupation,” Khalid, a visitor from northern West Bank city of Jenin, said. “We need singing and joy. We need to live a human life.” He expressed hope that this event will place Nablus, a city of 200,000, once again on the map as the capital of the Palestinian economy.